The only thing wrong with children, are the adults around them. What scares me are the 'games' that teach children to kill humans. How can we expect people to care about animals if they don't even care about other people? Obviously the group in that restaurant didn't care about anyone beyond themselves. Far too much of that now. You know for all the faults of this Red state, a restaurant here would never allow him to get away with that. The County Health Department regularly shuts down buffets that allow the reuse of plates. It is considered a MAJOR health code violation. Table servers are VERY vigilant in getting dirty dishes picked up from tables. Your group in camo, if typical of that mentality, would NEVER think twice about these actions, since obviously that's woman's work and worries. Your group in camo, if typical of that mentality, would NEVER think twice about these actions, since obviously that's woman's work and worries. That is indeed the mental state of far too many in my area, APL. 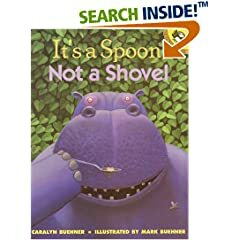 The kid in this story needs to read this book: It's a Spoon, Not a Shovel. His father should read it to him! Maybe they'd both learn something.